I don't have any proper oscilloscope probes, so I just cut a BNC patch cable in half and then soldered a couple twisted pairs from a CAT5 cable to the ends. I'm not using them for any really sensitive low voltage applications or high frequency stuff so no sheilding and whatnot is totally fine. Now that I knew the signals that I needed to emulate, I just spent a bit of time with the oscilloscope, one channel hooked up to the original joystick and one channel hooked up to the DAC's output, making sure I ended up always inside the original joystick's envelope for the X and Y axes. It would have been nice to have a 4 channel scope while I was doing that, but I made do. 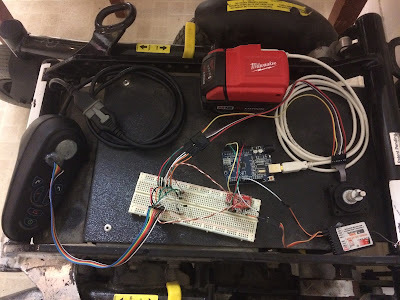 Once I had a good match from the RC stick to the original joystick, I shut everything off, disconnected the direction wires from the joystick (Left it with power and the center signal because the controller board needs to see that.) and connected them to the DACs. 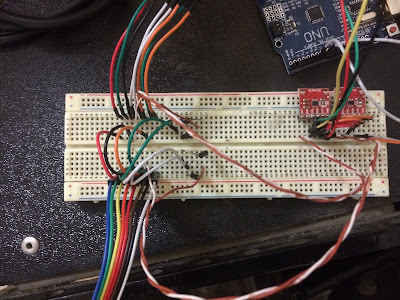 I didn't want to just put both inputs from each channel together on the same output from the DAC because I assumed (and read elsewhere on the net) that the control board has some logic that detects that and locks out. So all I did was connect the DAC output to the anode of two diodes, and one channel to each of the cathode. Aside from the voltage drop across the diodes that made me run thru the whole process of connecting the scope up and matching the signals again, this has been working perfectly and only requires me use one DAC for steering and one for throttle. And heres a closeup of the electronics that make it run. The UNO clone provides power is connected over I2C to the two DACs on the right side of the breadboard. Those provide the voltage out, which is fed over the brown and white twisted pair to the other side of the board, thru the diodes and to the wheelchair control box. The ribbon cable out the bottom goes to the wheelchair box and the wires coming out the top go to the joystick. Since I got it all working and controlled by an RC transmitter, the next logical thing to do was tie down strap my snowboard onto the top of the chair and go for a rip around the neighbourhood. I got more than one strange look but I had a lot of fun. Anyways thats all Ive got for now, next up is building a failsafe/joystick isolation board for a bit of safety and allowing me to seperate the added electronics from the original wheelchair electronics. Thats it, thats all folks!